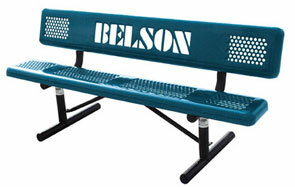 Generate higher brand awareness and recognition with a customized steel park bench. Our laser cutting process precisely creates logos, messages, or inspiring Buddy Bench designs to the seat back of this 6' or 8' bench. This traditional style bench is great for outdoors. It features a smooth perforated design, preventing moisture or water from pooling on the surface. The seat and back is finished in a highly durable polyethylene coating that assists in shielding away moisture. The steel supports and legs are sealed in a top grade powder-coating protecting against rust and corrosion. Portable, Surface and In-Ground Mount models available.